Hydrogels are very important for biomedical applications because they can be chemically manipulated to alter and control the hydrogel’s interaction with cells and tissues. Their flexibility and high water content is similar to that of natural tissue, making them extremely suitable for biomaterials applications. Biomedical hydrogels explores the diverse range and use of hydrogels, focusing on processing methods and novel applications in the field of implants and prostheses. Part one of this book concentrates on the processing of hydrogels, covering hydrogel swelling behaviour, superabsorbent cellulose-based hydrogels and regulation of novel hydrogel products, as well as chapters focusing on the structure and properties of hydrogels and different fabrication technologies. Part two covers existing and novel applications of hydrogels, including chapters on spinal disc and cartilage replacement implants, hydrogels for ophthalmic prostheses and hydrogels for wound healing applications. The role of hydrogels in imaging implants in situ is also discussed. 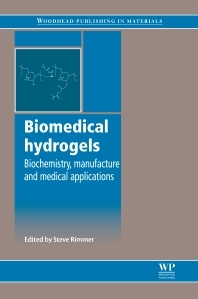 With its distinguished editor and international team of contributors, Biomedical hydrogels is an excellent reference for biomedical research scientists and engineers in industry and academia, as well as others involved in research in this area, such as research clinicians. Steve Rimmer is a Senior Lecturer in the Department of Chemistry at Sheffield University.